AN INSIDE LOOK AT JAPAN’S LEGENDARY $200 SQUARE WATERMELON - What About Watermelon? Did you know that in Japan it’s customary for people to give fruit as a gift? It’s not uncommon for someone to present his or her neighbor with a simple orange or a small bunch of grapes. Yep, fruit is pretty much revered in Japan. Well, maybe not revered, but they do take fruit pretty seriously, and that’s a good thing. They’ve even got high-end “fruit emporiums” where people can buy expensive, perfectly shaped fruits to give as gifts at special occasions like weddings, business meetings and hospital visits. One store sells apples for $21 each, strawberries for $69 a dozen and cherries for $159 per box. 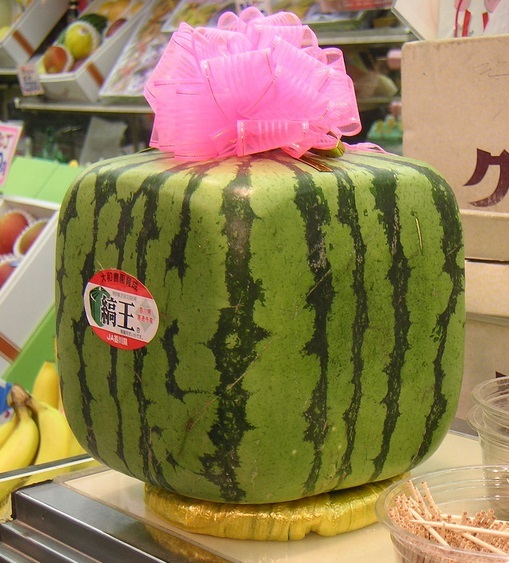 But, the star product is the legendary square watermelon, which carries a price tag of more than $200. I’ve talked in the past about how the square watermelon are made – essentially, the watermelons are grown inside a special, square-shaped box – but the video below offers a closer look at the fascinating fruit. The most incredible insight from the video: The super-expensive watermelons aren’t intended for eating because most of them aren’t even edible! That’s because they’re harvested before they’re fully ripe. Instead, most proud owners of a square watermelon simply keep them as a decorative accessory (they can be displayed for up to a year). I don’t know about you, but there’s no way I’d be able to “display” a watermelon for a year in my house. The longest I’ve ever kept a watermelon on my countertop was 37 and a half hours before I cut that sucker open and devoured it. UP NEXT: Watermelon on the cover of a magazine! SECOND SLICE: IS WATERMELON THE BEST FOOD EVER? SECOND SLICE: HOW LONG WILL MY WATERMELON LAST? THIRSTY? IT’S NATIONAL DRINK WATERMELON DAY! I sure am glad I live in the goood old USA. I can get a whole bin of sweet red “round” watermelons for less than $200. The square ones are kind of cool…. Good point, Jim! We take certain things for granted sometimes, and watermelon at a good price can be one of them!